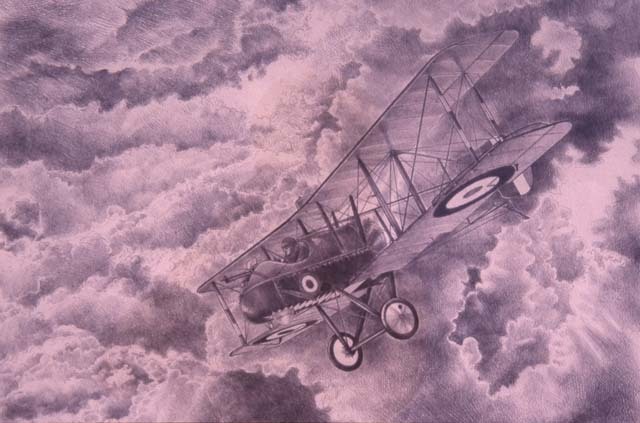 Aviation has its own gallery, distinct from other groups as I don’t do aviation art as such, nor do I aspire to. What is to be found here is a private expression about my personal visions or feelings about flight. 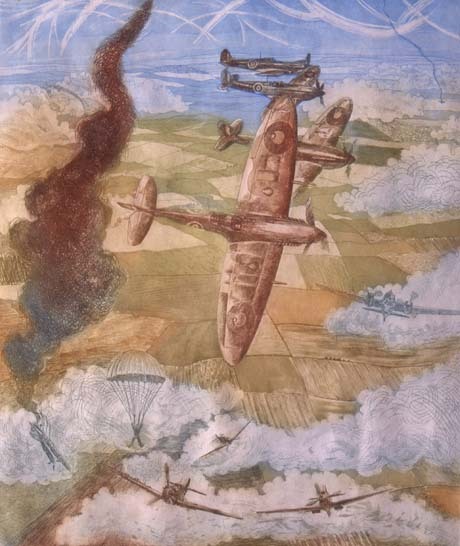 Most of the works were created before I learned to fly, and are impressions from a lost world of flight, from the 1st World War or the Battle of Britain. 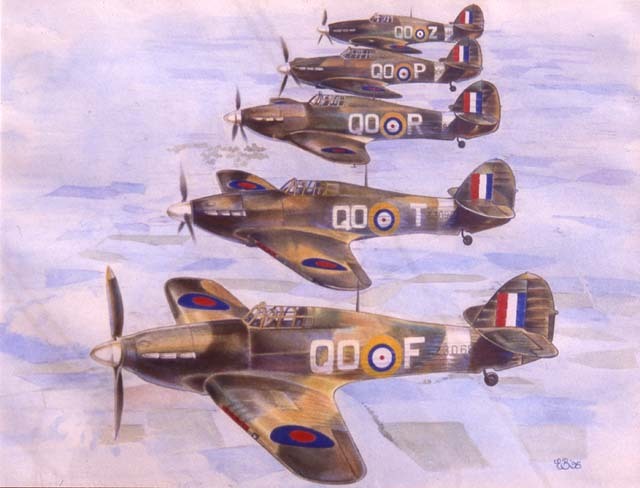 I was very interested in the genesis of the fighter squadron, and so my attention was drawn to 24 Squadron, the first fighter squadron which was stationed in France. 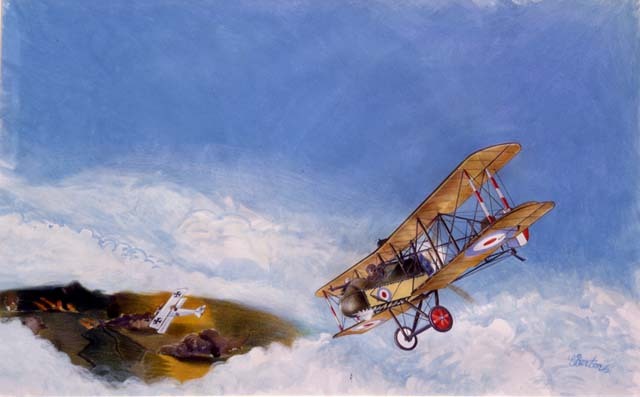 Its commanding officer was a quiet hero by the name of Lanoe Hawker, so where aircraft are depicted, their pilots usually also appear. The material for the finished works came about from visits to air shows, military airfields, aviation museums and the Imperial War Museum. Aviation historians have strong views about the personalities that flew these early creations. What passes from their lips, and what one reads about in aviation history are sometimes very much at odds. Some of the more renown personalities that have become iconic are viewed as ‘bores’; Richthofen is viewed with some disdain. (I disagree with this view). The disparity of fact and perception is part of the beauty of illusion. 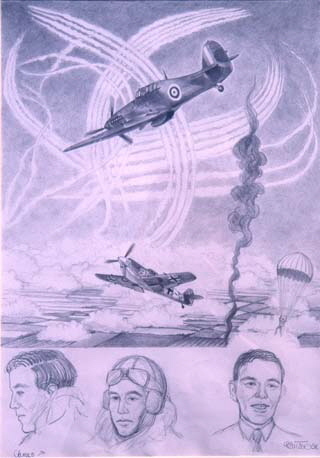 Whatever the personal bias, these pilots inspired me to become a pilot myself, and even appeared in my dreams. The way I discovered Major Hawker was synchronous and uncanny. 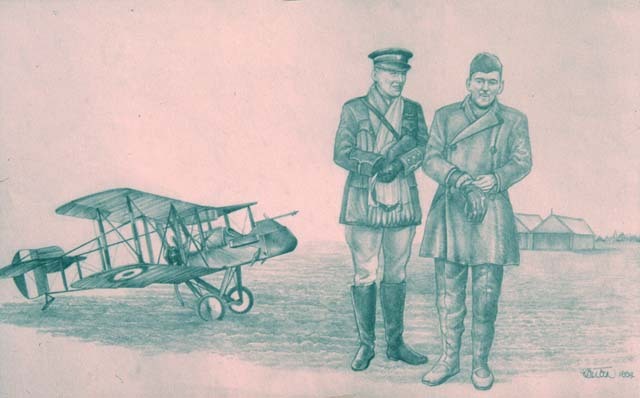 In 1995, before I ever set foot on an airfield, I dreamed that a pilot in old WWI clothes was describing to me the shape of the nacelle of the aircraft he flew, that it was like the curves of the back rest of the chair in which I loved to sit. In the dream, he was sitting in this chair. A few days later, I was in the local library. A book literally flew out of the stack above my head and almost fell on my head. I picked it up, and behold, it was a book about the air aces of the 1st world War. On the cover was a picture from an old photograph of the chap I dreamed about. Looking inside, I discovered his name was Major Lanoe Hawker. He is like a kind of companion spirit, and that fits in with his philosophy, I’m sure. In his quest to understand the workings of war and conflict, he believed it was a process by which the world of spirit and the physical world would be brought closer together. 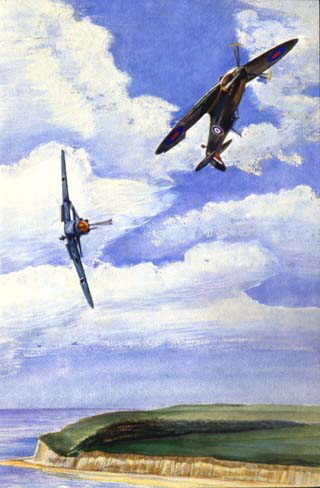 The other focus of interest is the Battle of Britain, perhaps the most pivotal and crucial aviation battle in modern history. 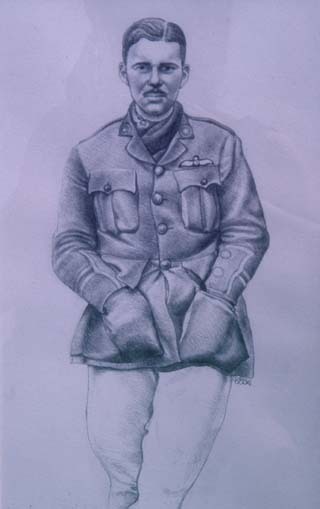 The military genius of Hugh Dowding was instrumental in its outcome. What might have become of our civilisation had the outcome been different presents many uncomfortable questions. No doubt historians will argue this point. Everyone is entitled to their point of view. I have done my own research. What remains is the stature of an outstanding military leader who stood apart from his contemporaries, but who was not given the accord and recognition he deserved. 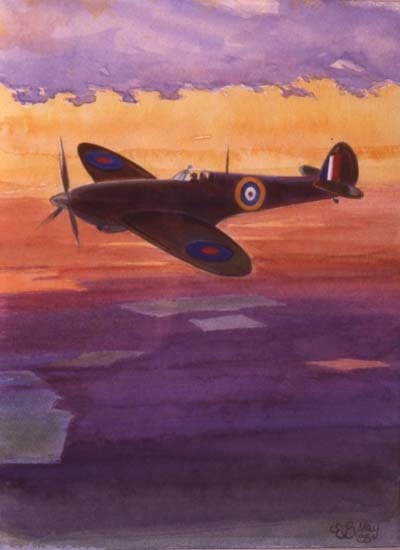 The aircraft like the spitfire and hurricane are iconic, symbols of a hope and freedom that nowadays is difficult to appreciate.